How Do I Get to the BarDew Valley Inn? From US-75, drive into Dewey, Oklahoma. Head west on 1500 Road. Turn right onto N 3940 Rd. Turn left onto BarDew Lake Rd/W1400 Rd. Continue 3/4 mile and we're on your left. How Far is the BarDew Valley Inn From the Pioneer Woman Mercantile? We're just a short 25-minute drive through the beautiful Osage to Pawhuska, Oklahoma where you will find the Pioneer Woman Mercantile, PTown Pizza, and more! What Does the Cost of our Room Include? Guests have access to the living room, dining room, kitchen, laundry facilities, and theatre room with hundreds of DVDs as well as the 14 acres of property. You will be served a free breakfast each morning during your stay prepared by your Innkeepers. Breakfast often features local baked goods and quiche, fresh eggs, seasonal fruits, and all you can drink coffee and tea. Our breakfast menu changes daily. 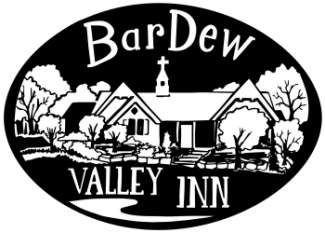 How Did You Get the Name BarDew Valley Inn? BarDew Lake is between Bartlesville and Dewey, Oklahoma and was once jointly owned by the two. The lake was a Civilian Conservation Corps project 70 years ago on land known as Stokes Hollow, owned by the family of Olive Stokes, who married Western film legend Tom Mix. The lake and surrounding land is now a privately owned. BarDew Valley Inn is across the street and shares water from the lake. Preferred check-in time is between 3:00 PM and 6:00 PM. Should you arrive in town prior to 3:00 PM, please call to see if your room is available for an early check-in. Please let us know if you will be arriving after 6:00 PM. Someone will be on site to greet you and show you to your room. Check-out time is 11:00 AM. Arrangements for late check-outs must be made in advance. No refunds for early departures or no-shows. BarDew Valley Inn is a smoke-free Bed and Breakfast. There are designated smoking areas outside on the patios. Do You Provide Transportation from the Tulsa Airport? BarDew Valley Inn is regarded as a quiet escape and romantic getaway for most of our guests, and we work hard to foster that environment. Therefore, it is not an appropriate place for children under 12. Children 12+ are allowed if well-behaved. Younger children are allowed only if a group has secured the entire inn for their getaway. We do not provide extra beds in the rooms to accommodate children. For your safety and the safety of your children, it's important to remember that we have a large pond on the property. Do You Allow Pets at the BarDew Valley Inn? Yes, but only dogs and only if you book the New York Room. There is a $25 fee per dog per day. See our policies and procedures concerning our pet policy. To guarantee a reservation by phone or online, please provide a valid credit card number and expiration date. Full payment is required to reserve your room and will be confirmed via email provided at the time of booking. Non-receipt of an email does not negate your reservation. Airbnb service fees (if applicable) are refunded only if the reservation is canceled within 48 hours of booking and the guest has not checked-in yet. Cancellation of a package will be charged a $55 processing fee. If you must cancel your reservation due to inclement weather, your balance will be charged and you will be issued a non-transferable BarDew Valley Inn gift certificate for the full amount of your reservation (valid for 6 months). Do You Have a Damages Policy? BarDew Valley Inn is privately owned and will not be responsible for the loss of money, jewelry, or valuables of any kind. Damages incurred during your stay to furnishings, bedding, linens, towels, rugs, etc. will be charged to your credit card on file. Management determines the charges which are non-negotiable and might vary depending on the actions taken to repair or replace the item(s). All rooms are non-smoking. Smoking areas are allowed outside on the patios only. Guests who smoke in any indoor area of the Inn including the bathroom will be charged an extra fee (up to $150) to clean and repair the room. Please be considerate of all other guests while smoking in allowed areas. How Are the Room Rates Calculated? Rates are based upon double occupancy and do not include applicable taxes. Some rooms can accommodate a third person (extra fees apply). MasterCard, Visa, Discover and American Express and Cash accepted. Do The Innkeepers Live Onsite? Absolutely! This is our home. We have lived in the area for many years and are personal friends of the Drummonds. We can give you inside information to the best spots and attractions around town, things you won't find in any travel guides. This includes restaurants, bars, bike rentals, shopping, event tickets, and even yoga. Whatever your heart desires, rest assured you'll find it on your trip. Is There Anything Special to Know While on the Property? We have a large pond and we're encircled by woods. For your safety, please be aware of your surroundings. You'll see all sorts of animals, birds, and creepy crawlies. The neighbor's dogs, miniature horses, guineas, and chickens often come to visit. View more information on our Policies and Procedures page.